Getting married? Awesome. Getting married on the beach? How sweet is that? 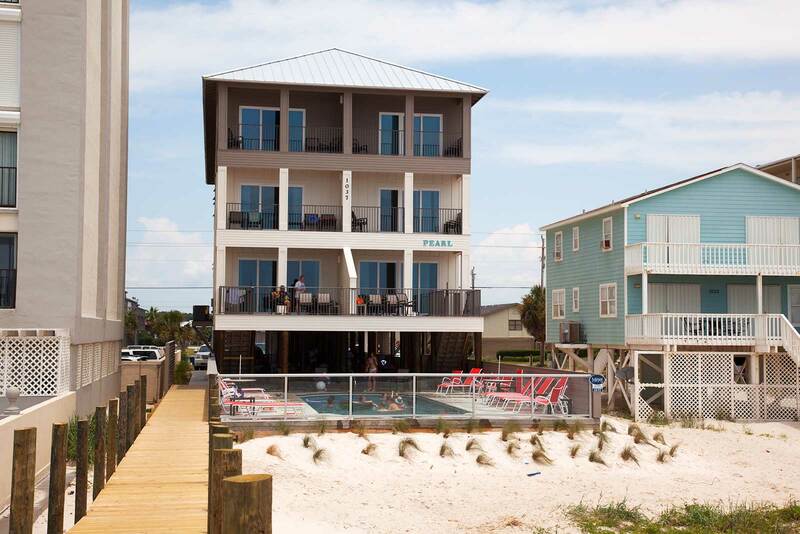 We have the perfect homes for your Gulf Shores beach wedding. Weddings on the beach can be the perfect way to start your life together, and we have the perfect vacation homes to host your beachside wedding in Gulf Shores or Orange Beach Alabama. From small houses to oversized homes, we own homes that will put the icing on your Gulf Shores beach wedding cake! 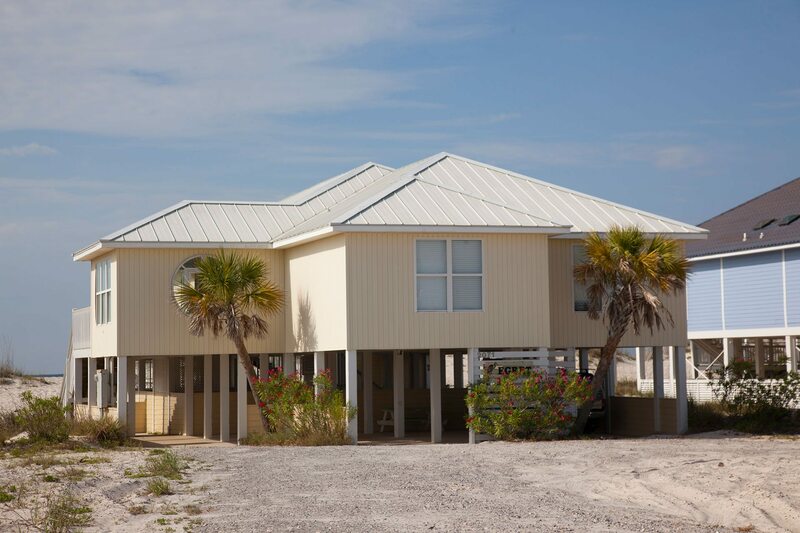 What should you look for in a Gulf Shores beach wedding vacation home? Weddings on the beach should be scenic, and relaxing! Weddings on the beach should be, well, on the beach! That’s exactly where most of our houses are. There is nothing between the deck and your Gulf Shores beach wedding except sand, and perhaps a pool! That’s the way it should be. No roads to travel. Just bride, groom, family, friends, officiant, and beautiful beach! Most of our homes are located right on the beach with the beach running east to west. What’s that mean!? Perfect sunset weddings! Or for you early risers, maybe a sunrise wedding is in the future? We can’t guarantee the weather of course (wish we could!) but the locations are perfect for getting married on the beach. Accessibility. Elevators. Single level floor plans. Got it! Mom, dad, grandparents, friends. Is someone in your wedding plans physically challenged? Just need a little more help (or a little less challenge?). We can do that. How about single level floor plans to minimize stairs? Or how about elevators inside the homes, with other accessibility features, like accessible bathrooms? Yep, we have you covered. You shouldn’t have to worry about people heading up 2 or 3 levels in a house when you can use an elevator instead! Appliances. Plural. Because 1 is never enough for a wedding. Come on. One fridge? Really?! This is a wedding we are talking about. You need at least two fridges for any home that’s going to host a Gulf Shores beach wedding, and we have two full size fridges in most units. Same goes for dishwashers. You need more than one. So we have more than one! Some of our places even have, yes, this is correct: two fridges, 3 wetbars (each with a standalone ice-maker and mini-fridge), 2 dishwashers, 3 washer and dryer units (one on each floor of the house, of course!). Entertainment amenities for you your Gulf Shores wedding. You want them. We have them! You want space. Lots of rooms. And not just bedrooms. Your Gulf Shores beach wedding needs lots of living space for people to prepare, congregate, and celebrate! Many of our homes have two, even three, living rooms. But what about more than rooms? Maybe you want MORE space? Got a really big wedding group? How about more than one house? All next to each other? You, your spouse, separate house! Yes, we can do that! We have locations where we have 2, 3, even 4 or more houses right next to each other. The Pearl duplex would also be perfect for this as would several other locations. Think of it as renting your own neighborhood for your wedding. Check out our Gulf Shores vacation homes for large groups for ideas about how we can make your larger Gulf Shores beach wedding happen in comfort and style! We’ve hosted numerous Gulf Shores weddings. From small, intimate affairs to large beachfront events. Give us a call and we will help you find the perfect house for your Alabama beach wedding! The Pearl for your Gulf Coast Wedding? Big. Bold. Beautiful. Luxury at its best! 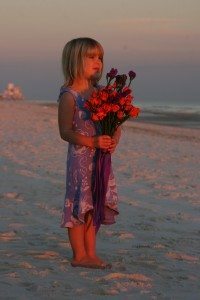 Where can you get help with your Gulf Shores beach wedding? Whether it is just you and newly to be, or a really large group of friends and family, our vacation houses can handle your beachfront wedding in style and comfort. Where can you get help planning your wedding? We aren’t wedding experts, although we did it (once, a while ago! ), we don’t remember all the details! That said, the Gulf Shores Visitors Bureau has some useful information and resources concerning holding a Gulf Shores beach wedding. Check them out, then hurry back and lock in one (or more than one) of our beachfront houses before its too late. How can we help you find your perfect Gulf Shores beach wedding vacation home? We own our homes. We’ve had friends and family hold weddings at our homes. We have new friends because they have held weddings at our Gulf Shores and Orange Beach houses. How can we help you start your perfect life together?